Reading silently improves students’ understanding because it helps them concentrate on what they are reading, rather than the pronunciation of individual words. When we read silently, we can form mental pictures of the topic being discussed. Also, we do not need to read one word at a time. When you encourage your students to read silently, you are helping them develop the strategies they need for reading fast, and with better comprehension. This is called reading efficiency, and it will help your students to read any text with maximum attention to meaning. Silent reading also helps develop the skills of reading for a purpose, as the focus is on understanding the content without the additional burden of having to pay attention to pronunciation. Research has shown that people read in sense groups, which means, roughly, that we read a number of words together so that they make sense to us. For example, this is how I read the first sentence of this paragraph: Reading silently/improves students’ understanding/because it helps them/ concentrate on/what they are reading,/rather than the pronunciation of individual words. Within these groups of words, our eyes stop at the content words (reading, silently, improves, students’, because, helps, concentrate, etc.) — that is, nouns, adjectives, verbs, etc., the words that carry independent meaning — and skip over the function words (it, them, on, the, of, etc.) — that is, grammatical words such as articles and other determiners. The activities in this unit will demonstrate certain strategies that students can use to become more efficient readers. It will also introduce you to the technique of classifying the contents of a text according to main and subordinate ideas, illustrations and information that is not directly related to the topic, and adjusting our reading speed accordingly. help students improve their reading efficiency through understanding how to interpret information given in graphical form. In this unit you will be able to help students practise the strategies used in silent reading to improve their reading speed and skills. After the activities, you should begin to see gradual improvement in their comprehension. This is because silent reading helps students to focus their attention on the text; their increased concentration on the text is sustained until the entire text is read. This also helps students absorb ideas into their subconscious and then use them in their daily lives. Hassan Muammar was a student at St. Michael’s Junior Academy. He enjoyed being at this school because of its extracurricular activities. He was a good rugby player and he loved football. His friends attributed his success to his physique: his height and an agile body that enabled him to run fast. But something always bothered Hassan. Though he loved the extracurricular activities, he knew his mother would not be pleased if he did not improve his fluency in reading. He always stammered and faltered over words in class, was usually the last to finish reading any text and found it very difficult to remember what he had read. One Monday he shared his concerns about his reading problems with his English teacher. The teacher was not surprised; he had noticed that most of his students were good at sports, especially rugby and football, but were poor readers. The teacher realised that he had to find strategies for developing his students’ fluency, speed and interest in reading. The teacher first initiated a class discussion on reading stories, asking his students about the kinds of stories they liked to read. Most students said they loved to listen to stories, but did not enjoy reading them as it took them a long time to finish reading a story book. The teacher then announced that he would tell them the first parts of two interesting stories and, if they liked them, they would have to read the next parts themselves. The students were happy with this arrangement, and readily agreed to the plan. He then announced the name of the first story: “Ambrose.” To motivate the students to listen, the teacher informed them that the story was set in ancient Greece. He then divided his class into groups of three students, and told each group to write down three things that they expected to hear in the story. The students took up the challenge, and came up with many interesting ideas about what they thought they would learn about Ambrose when they heard the story. The purpose of this game was to make the students excited about reading the story, and the teacher was happy to note he had succeeded in increasing their motivation. To maintain this excitement, the teacher told them that he would not tell them whether they had guessed correctly. If they wanted to know what really happened to Ambrose, they would have to find out from the story itself! He then read out the first paragraph of “Ambrose.” Some of the things the students guessed turned out to be correct, while others were quite off the mark. The students enjoyed listening to one another’s guesses, and became impatient to find out if the rest of the story confirmed their guesses. Then he instructed the class to read the story for themselves and find out whether they had guessed correctly. Do you have poor readers in your class? Do you think this kind of strategy would work in your situation? Can you think of other ways in which we can motivate students to read? Do you think they can only begin at the JSS level, or should the habit of reading begin well before that? Reading has been called a “psychological guessing game.” Many experts believe that the reader makes guesses about what is going to appear next; when the predictions are correct, they read easily and efficiently. Reading requires much guessing at a variety of levels. Readers can use guessing to their advantage to guess context messages, cultural references, implied meaning, grammatical and organisational relationships and the meaning of words. Since reading with understanding is a process of linking new information to what we already know, we bring our knowledge of the world, subject matter and context into our knowledge of language (its grammar, vocabulary and orthography). It is not possible, or even desirable, for students to refer to a dictionary every time they come across a difficult word. This would reduce their speed, slow down comprehension and reduce interest. It is better to teach students to make intelligent guesses about the meaning of a word from the clues that can be found in the surrounding words and sentences. In this activity, you will learn how to help students guess meaning from context. Before the activity, have a class discussion on how often students refer to a dictionary when they are reading something. Put them in small groups and ask them to quickly brainstorm on the advantages of using a dictionary regularly. During the feedback, ask them if they refer to the dictionary every time they come across a difficult or new word. Make them think about the possible disadvantages of this habit, but remind them that sometimes it is necessary to go to the dictionary. Gradually bring the discussion around to what they do when they come across an unfamiliar word in any passage that they are reading. Possible responses would be ignoring the word and moving on, referring to a dictionary, trying to guess the meaning and so on. Now give them the following example to show how we look for clues for the meaning of a word in the surrounding words or sentences. He tried to open the box with no luck. He couldn’t find the key, so he decided to use a smidget. What do you think smidget means? A smidget is something that is used to open a box. It sounds like the word midget, which means small. Is it something very heavy, like a hammer that is used to break a lock? Is it something very small, like a hairpin that can be used to pick a lock? Now give them the final sentences of the paragraph. Did they guess correctly? He got a thick wire from the shed, bent it in the shape of a smidget, and inserted it into the keyhole. Sure enough, the lock turned easily. Smidget: A small object made of metal that can be used as a tool. Below are some more short passages for practice. Ask the students to guess the meanings by using the same strategies. His father, Dondinho, was a professional soccer player and that was their only source of income. Though he grew up in poverty he learned to love and enjoy soccer in the sporty atmosphere of his home. Icarus and his father collected lots of bird feathers and made two pairs of wings. One morning, they fastened the wings to their shoulders with wax and were ready to fly. Why we are reading a particular piece of material influences how we read it. Different materials require different levels of comprehension and recall. For example, we may not need to recall everything when leisurely reading an article in a newspaper, but we do need a high level of comprehension and recall when reading a contract that we plan to sign. When reading course assignments, our purpose may vary as well. We might read a Psychology assignment very closely in preparation for an exam; we might read a portion of a Science text only to learn (and remember) how many types of metals there are. As our comprehension varies, so does our reading speed. In general, we find that as the level of comprehension required decreases (e.g., when reading a magazine as we wait in the doctor’s office), our reading speed increases. Note that with reading, flexibility is required. A newspaper will be easier to read because we are scanning through the articles, but if we have an article addressing a specific subject, we might be forced to slow down so that we comprehend and remember the details. This ability to adjust our reading rate and methods to suit the type of text we are reading and why we are reading it is called reading flexibility. To develop reading flexibility, your students should read different types of texts, and then reflect on whether they read different books with the same speed or effort. An appropriate exercise is given in Resource 2a, which contains two texts. Have the students read the two resources silently and time themselves. Now ask them which resource they found easier to read. Tell them to think of some reasons for this. To conclude, take the students through the table in Resource 2b, and draw their attention to the fact that we vary our reading speed according to the type of text and how much comprehension is required. Whether we read academic or non-academic texts, we know that texts do not contain only words. Some texts give us information in other ways, with diagrams, maps, flowcharts, tables and so on. Our reading speed is affected by how we “decipher” or “decode” the information given graphically in a text. This exercise demonstrates how we can help students to understand information given in visual form. Have your students brainstorm on the different ways in which information is given in, for instance, their Science textbook. Prompt them to think about a typical chapter, and the kinds of ways in which words are arranged in it. (Give them a hint: How is a scientific experiment described?) Show them the pictures in Resource 3a and draw their attention to the non-textual elements such as the diagram and the table. Now show them the text and table given in Resource 3b, and in groups, ask them to compare the advantages and disadvantages of reading information in text form and graphical form. Note: The sample text is related to the topic of reading, but it may not be easy for students to understand. The important thing here is not to have students understand the passage, but to make them notice the different ways in which information has been presented. They should come up with points like: it is easier to remember information given in a table, it takes much less time and skill to understand something presented in graphical form, and information can be presented in a logical and orderly manner in a chart or table. Finally, give them an exercise to practise their own skills in interpreting information or data given in graphic form. Resource 4 is a histogram showing students’ study hours for a secondary school. The students have to answer questions based on the diagram to find out how best to understand information given in tabular form. This exercise gives them practice in comparing information across columns and rows, locating specific information on a graph, interpreting facts and figures, etc. In this unit you learned that reading efficiency and speed increase when people read silently. You also learned about some strategies and skills that your students should practise to improve their comprehension skills and reading speed. When students see an improvement in their ability to read texts with understanding and speed, their confidence in reading will increase, and this should motivate them to read more. The ability to recognise text types and topics is an added skill that will help students to improve their reading skills. Did you find the activities relevant and interesting? Did the resources motivate your students to read more? Did the students participate actively in the activities? Were the activities too difficult for some students? How did you help them? In your opinion, should anything have been done differently? Think of two more activities to develop reading speed, using the students’ course books. Also note down possible challenges that you might encounter in having your students do the activity in class. Look for a table of information in any of your students’ other subject textbooks, and design a set of questions around it. 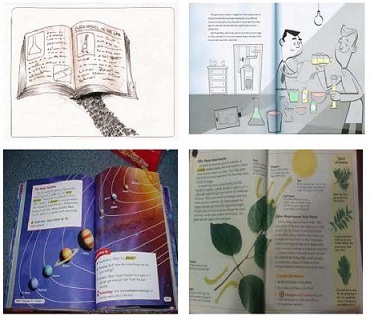 Collect other kinds of visual information that students usually have to read, and use them to test whether the students understand graphical presentations of information. Prefixes: (anti-, pro-, un-, dis-, co-, etc). For example, prefixes like un- or dis- usually carry a negative meaning, so we can guess that a word like uncertain has some negative connotation. Suffixes: (-tion, al, -ist,-ism,-tive, ally, etc). For example, suffixes like –tion make a word a noun, while –tive will make a word an adjective. Roots that are familiar (re-place-ment, wander-lust, etc.). Grammatical context that signals information (noun, verb, adjective, etc.). For example, if a word sits between an article and a noun, it functions as an adjective; that is, it is being used to describe something. Knowledge of the topic and whether the word in question is central to understanding the topic. Understanding the main ideas expressed until one meets the unfamiliar word. Frequency of occurrence of the word in question. If it appears only once, and is in an example, the word can be ignored. However, if the word recurs in crucial positions, we may have to look up the dictionary for its exact definition. In Kenya, the general education policies are based on the belief that all people should have equal chances. This means none should be denied education on the basis of their race, age, gender or religion. Education should lead to social equality and responsibility. Free primary education has led to a general increase in enrolment in primary school. Many children who had been left out because of economic reasons now have a chance to go to school. This has led to a significant increase in enrolment, especially amongst girls. If this policy is extended to secondary school, there will probably be an increase in the enrolment of girls in secondary school as well. If more girls have the opportunity to complete a secondary education, they will have more opportunity to enrol in colleges and seek better employment. Although primary school enrolment of girls roughly equals that of boys in some places, about two-thirds of the world’s illiterate adults are women. Of the more than 100 million children who drop out of school before completing standard four, two-thirds are girls. To deal with the high dropout rate amongst girls, the Government of Kenya has come up with awareness programmes to improve the lives of girls, so that they can be motivated to attend school. Education is important in enabling women to improve their standards of living. Although women provide important labour, especially in the agricultural sector, they receive very little for their effort. Education will enable women to have access to better paying employment. A long, long, time ago, in the distant village of Kithare, there lived a man and his wife. The man worked on his farm every day. One day, the wife gave birth to a beautiful baby girl. She named her Lora. The mother fed the child on bananas, potatoes, rice, bread, maize, beans and vegetables. Each day the baby grew older and more beautiful. “Oh! My daughter will attract many suitors when she is of age,” she whispered to herself. One day, the mother got sick. No medicine man could cure her and she died. The husband was left alone with his daughter. So he married another wife. The second wife gave birth to a baby girl. She named her Rosina. The two girls grew up together. They were soon inseparable. They fetched water from the river together, they weeded the farm together, they gathered firewood together, they cooked together and even slept on the same bed. Lora grew more beautiful each day but Rosina was not beautiful. Lora’s beauty was the talk of the village. Soon, suitors began visiting the homestead to ask for Lora’s hand in marriage. Reading rate, free recall, cued recall, and comprehension data are presented in Table 1. Means for each of these variables were compared using paired-sample t-tests with medium of text presentation (i.e., paper and computer) as the independent variable. Effect sizes were calculated and are reported as Cohen’s d. Children spent a mean of 2.5 minutes (SD = 0.8) reading text on paper compared to a mean of 2.8 minutes (SD = 1.0) reading text on the computer monitor. Reading rates in words per minute were calculated because one passage was slightly longer than the other. Children read the paper text at a faster rate than the computer text (t(59) = 5.16, P = 0.001, d = 0.35). When asked to recall as much information from the text as they could, participants recalled more of the text that they had read on the computer than the text that they had read on paper (t(59) = 2.37, P = 0.02, d = 0.25). There were no reliable differences of presentation medium on cued recall (t(59) = 0.00) or comprehension (t(59) = 0.17, P = 0.87). It is possible that the observed higher free recall scores after reading from computer screens may have been a result of greater reading time. Analysing efficiency rather than accuracy is one way to examine this time/accuracy trade-off. Carver (1990) calculated reading efficiency (E) as the product of the accuracy of comprehension (A) and the rate at which information is presented (R), where E = AR. In the present study, accuracy of recall and comprehension were defined as the proportion of correct responses on the respective tests. Rate of presentation is the individual’s reading rate expressed in words per minute. The efficiency equation yields an estimate of how much of the text was recalled or comprehended per minute of reading. The best observed free recall score plus one was deemed “maximum” free recall, and was used in calculating free recall efficiency. Means and analyses of the efficiency variables are included in Table 1. Table 1: Descriptive statistics for recall and comprehension by presentation medium. The chart above tells us what percentage of their time students of City Secondary School spend studying. Look at the chart carefully and answer the questions below. 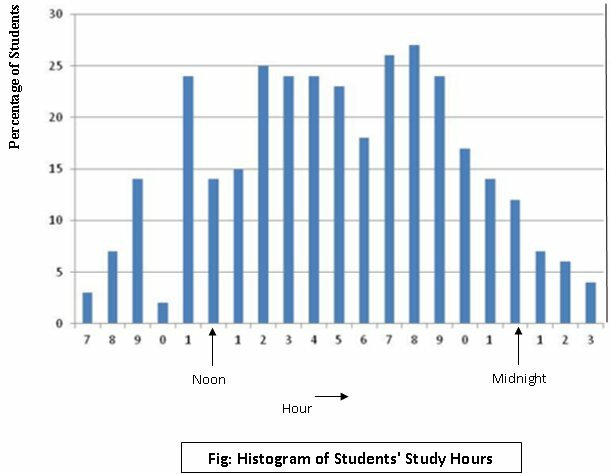 What percentage of students study between midnight and 1:00 a.m.? What is the most popular study hour? Why do you think only about 22% students study at home between 8:00 a.m. and 2:00 p.m.? Why does the chart show students’ hours only from 7:00 a.m. until 3:00 a.m.? During which hours do more than 25% of students study? Question: Do you think students should be encouraged to read silently? Should children read aloud so that their pronunciation improves? Answer: The answer to this question is in the question itself: reading aloud helps improve pronunciation. But it slows down the speed of reading, and diverts our concentration from the meaning. This leads to poor understanding, and also prevents us from remembering important points. Question: How can I make students realise that practising these reading skills will improve their reading speed and comprehension? Answer: You can encourage them to keep a record of their reading speed in a journal or logbook. Tell them to note the starting and ending time every time they read a book using these skills. At the end of the month, they can compare their reading speed. Reading speed is calculated in terms of words per minute (wpm). So if I take three minutes to read a passage of 300 words, my reading speed is 100 wpm.